Super Savings Item! Free Shipping Included! 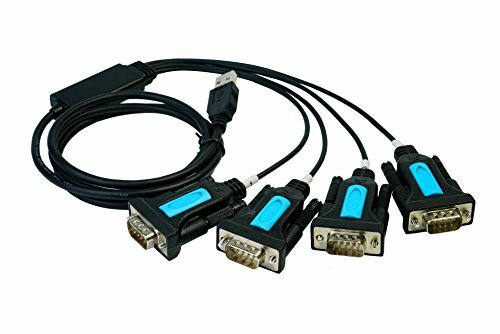 Save 31% on the TECHTOO 4 Port Professional FTDI CHIP USB to Serial RS232 DB9 Adapter Converter Serial Cable 9-Pin Male to Male with Thumbscrews by TECHTOO at High IQ Business Network. MPN: STKC-USB2-RS232-4PSCREW. Hurry! Limited time offer. Offer valid only while supplies last. TECHTOO, known as a worldwide registered brand owned by TECHTOO Inc. is one of the most desired brand in North America, Europe and Asia. TECHTOO, known as a worldwide registered brand owned by TECHTOO Inc. is one of the most desired brand in North America, Europe and Asia. TECHTOO USB to RS232 DB9 Serial MALE Converter Adapter Cable is designed to connect serial devices such as PCs with RS-232 ports, Bluetooth serial adapters, PDAs, GPS receivers, routers, firewalls, modems, printers, cash registers, embedded character displays, scan tools, sonar units, embedded boards, etc. The USB RS232A converter features a Prolific chipset for the best combination of performance and wide driver support.and Microsoft signed drivers for 32/64-bit is easy to install and offers broad operating system compatibility, including Windows 8, Linux and Mac OS, for easy integration into mixed environments. Legal Statement: Copyright 2016 by TECHTOO Inc. All rights reserved.